The Firefly Tech clips work just as well. You can only fit 4 18 Dart drums on the Hail-Fire. 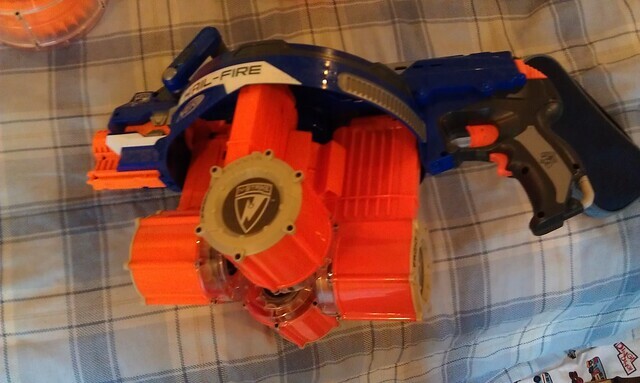 The protruding design blocks the other slots on the Hail-Fire. Two Raider Drums and a Rampage drum on the Hail-Fire. If I had bigger drums, I would try testing them on this. Two Raider drums on the Hail-Fire, you could probably fit a 3rd one in here. You could probably fit 4 Raider drums on the Hailfire. Hm…. So there’s absolutely no problem with Firefly Tech clips? 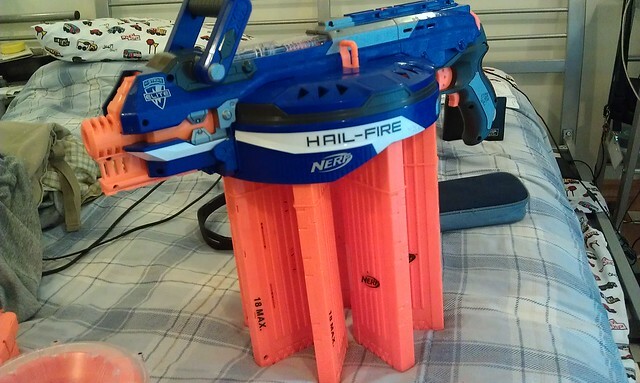 TBH though the Hailfire looks quite wierd with anything but 6 clips. Not that your enemies would care when you carry this 144 capacity beast towards them. 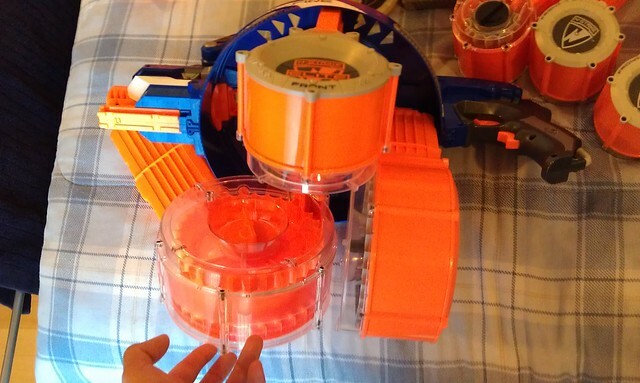 At the HvZ game tomorrow I’ll see if I can borrow some Raider drums for that experiment. Yeah no problem with the Firefly Tech clips. I mean their a little close to the other 18s due their battery storage, but you can still take them out just as easy. I figure you can probably fit two raider drums, two six clips, and four eighteens at max. That’d be pretty rad. Give you a nice 156 (sorry, I’m mathing of the top of my head) dart capacity. Nope, can’t fit a 6 rounder under the overhang of a drum. So max is 144 (18*8) as claimed. 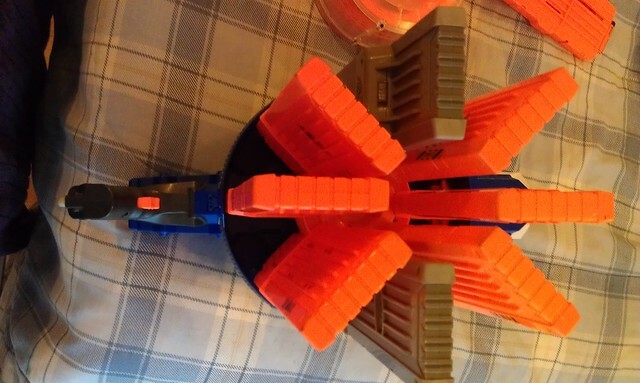 Wow, those 18-rounders probably double the awkwardness of what was already a terrible gun ergonomics-wise. Going by the AFON show, you can only fit two Raider drums into the carousel. And speaking of AFON, do you have any flip-clip connectors to test if they fit on the clips in the carousel? 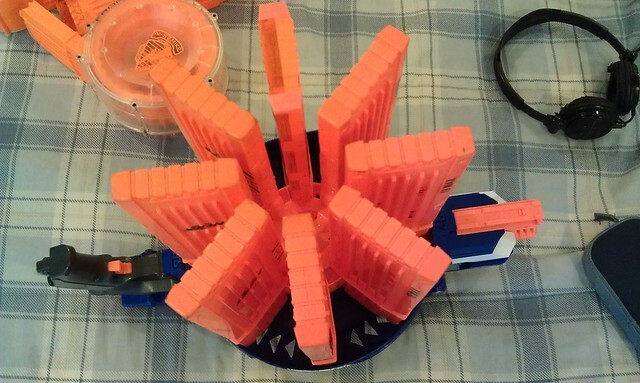 how many slots does a 25-dart drum take? 3 slots, the slot you put it in and both of the slots next to it. 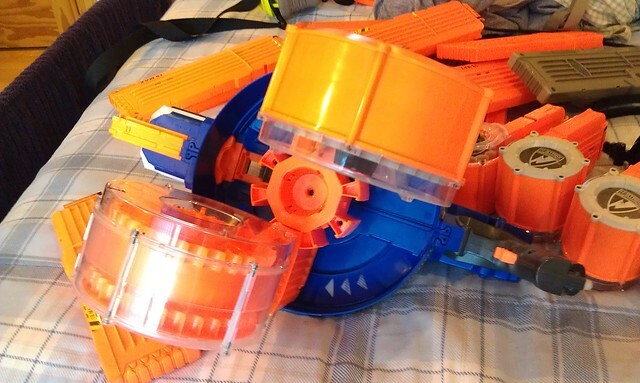 That’s why you can only fit two 25-dart drums in 8 slots. 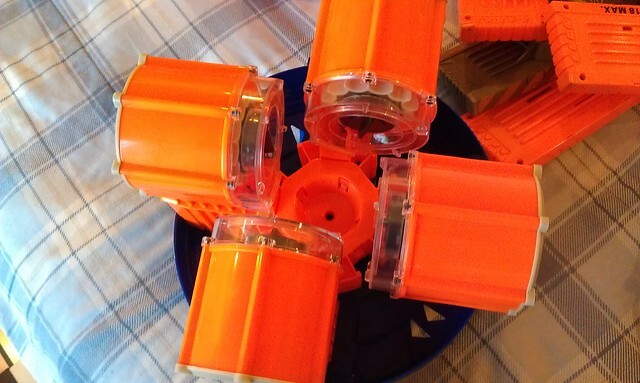 35-dart drums, on the other hand, only take 2 slots so you can fit 4 of them.